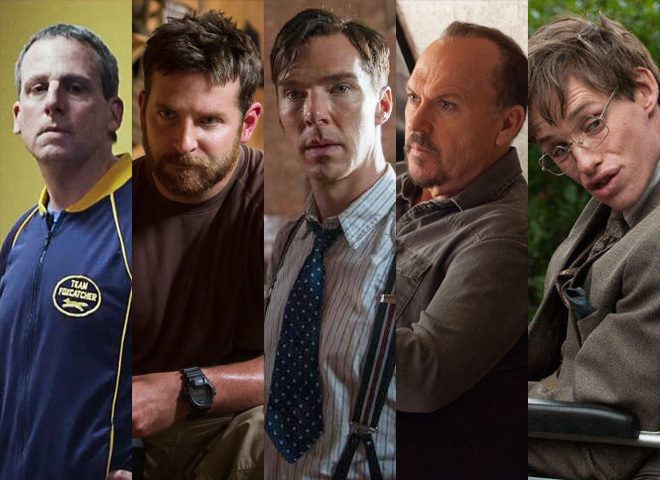 Which of this year's candidates for the Best Actor Academy Award do you think should take home the Oscar? "Foxcatcher" follows the tragic true story of wrestling's Schulz brothers, Dave (played by Mark Ruffalo) and Mark (played by Channing Tatum), both Olympic champions, who fall under the influence of a millionaire. In "Foxcatcher," Steve Carell portrays John du Pont, the wealthy, eccentric benefactor of a wrestling team. "I didn't know how it was going to work out, I didn't know if I was right for it or whether it was something I could pull off and it was definitely out of my comfort zone," the former star of "The Office" told CBS News about the role. "I think that was a good thing because I learned a lot from it." This marks the 52-year-old actor's first Oscar nomination. Bradley Cooper plays Navy SEAL Chris Kyle in the box office-topper "American Sniper," directed by Clint Eastwood. Cooper told CBS News that Eastwood was very involved in the process, walking him through every step during filming. "He's close by," Cooper, 40, said. "There's no way I could've done what I did without that. There's just no way. I mean, if you have a guy like that with you in the trenches, telling the same story with you and you feel like he's got your back, basically, I just felt myself to be so much freer--as opposed to him being 20 feet away underneath a tent with a monitor, telling somebody else to come out and tell me something. That's gold, man-- that's gold for an actor to have your director be right there." This marks Coopers third consecutive career acting nomination -- following nods for "Silver Linings Playbook" and "American Hustle." Bradley Cooper: "American Sniper" is not "a war movie"
Like Carell, this marks Benedict Cumberbatch's first Oscar nomination. In "The Imitation Game," he plays British math genius Alan Turing. The code-breaking genius helped win World War II but was later persecuted for being gay and committed suicide. "The man was and is still regarded quite rightfully as the forefather of computer science, the forerunner, the inventor of it," Cumberbatch told CBS News. "To bring him to other people through the film for me is -- it's a huge honor personally and something I feel very strongly about. This man needs recognition." Michael Keaton is another newbie to the Oscar nominees list. In "Birdman," Keaton, 63, plays Riggan Thomson, an actor who rises to fame after playing comic book superhero dubbed The Birdman. His popularity doesn't last forever, and in this film, Riggan tries to mount a comeback on Broadway to prove to his fans that there's more to him than The Birdman. "I probably relate less to this character than anybody I've ever done, that's the irony," Keaton told CBS News. "I'm not, I've never been that." Michael Keaton takes wing in "Birdman"
Eddie Redmayne goes through a massive transformation in "The Theory of Everything." The 33-year-old British actor plays world-famous physicist Stephen Hawking in the film, which follows him as a healthy young man into his life in a wheelchair because of the debilitating disease, ALS. The first-time nominee told CBS News he watched old videos to mimic Hawking's movements: "I had so much documentary information, videos on an iPad and of him and I'd spent so long in front of a mirror, trying to replicate his facial muscles and really trying to get a sense of who he was. So it was less lines and it was more just, it was more learning to act, because as Stephen's muscles stopped working on his face, he uses any muscles that are left, muscles we wouldn't normally use, all these sorts of muscles...for his expression." Eddie Redmayne on breakout role in "The Theory of Everything"
Benedict Cumberbatch, "The Imitation Game" Eddie Redmayne, "The Theory of Everything" Steve Carell, "Foxcatcher" Bradley Cooper, "American Sniper" Michael Keaton, "Birdman"